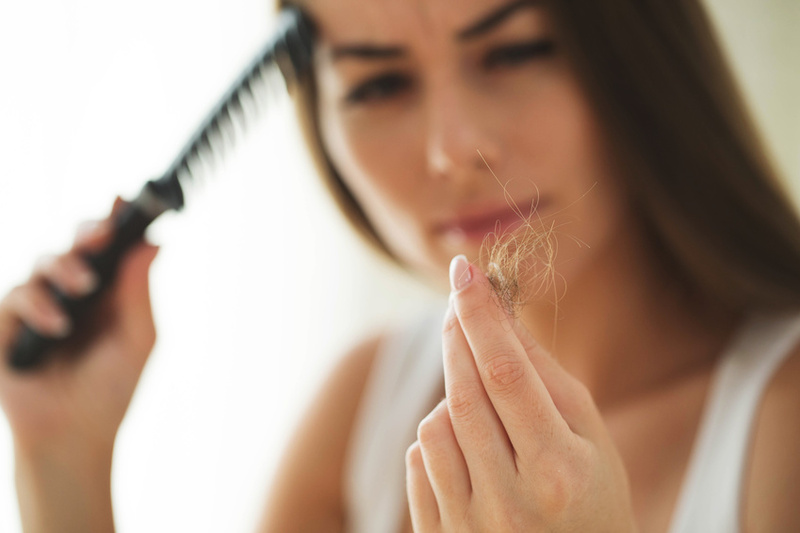 Though it isn’t often talked about, hair loss affects just about everyone, including women. While this issue is pretty hush-hush in the world of beauty, countless women suffer from hair loss every year, due to a variety of health conditions. The truth about hair loss in women might not seem pretty but it’s more common than we ever could have realized. Here’s what you should know about hair loss in women and what you can do to help bring your mane back to life. Every day you shed hair. You’ll find it in the shower drain, in the bristles of your brush, even on your clothes. Though we shed hair virtually all the time, some of us tend to shed hair a little more than others. And when you start to notice thinning spots of hair on your scalp, you may become worried. If you suffer from one or more of these factors, you’re at a higher risk for temporary hair loss. Permanent hair loss becomes more stressful for women since it’s unlikely you can grow this hair back on your own. Female pattern baldness is caused by hormonal imbalances which typically occur before, after, or during menopause. As the hormone levels in your body change, other parts of your body are affected, including your hair. This is more common in people who have a history of female pattern baldness. An injury that results in a scar can also prevent hair from growing in localized areas on the scalp. Nearly 47% of people who suffer from hair loss claim they would spend their entire life savings if it meant they could have a full head of hair again but this cost isn’t necessary. There are a number of ways you can protect the hair on your head and feel confident when you experience hair loss. Along with taking nutritional supplements and being gentle when you wash, style, and brush your hair, you can add volume and shine with celebrity hair extensions. Hand tied extensions can be used to mask the appearance of balding in many people. Individual hair extensions look and feel like your real hair and they won’t damage the hair you already have. With non damaging extensions offered by Chaviv Hair, you never need to worry about spending your life savings again. Contact Chaviv Hair today to get the best in non damaging individual hair extensions. Whether you want keratin extensions, microbeaded extensions, or individual hair extensions, we have the expertise and quality products to make you look as good as you feel. Your beauty is our mission.